The product contains: royal jelly, honey, concentrated orange juice and fructose. 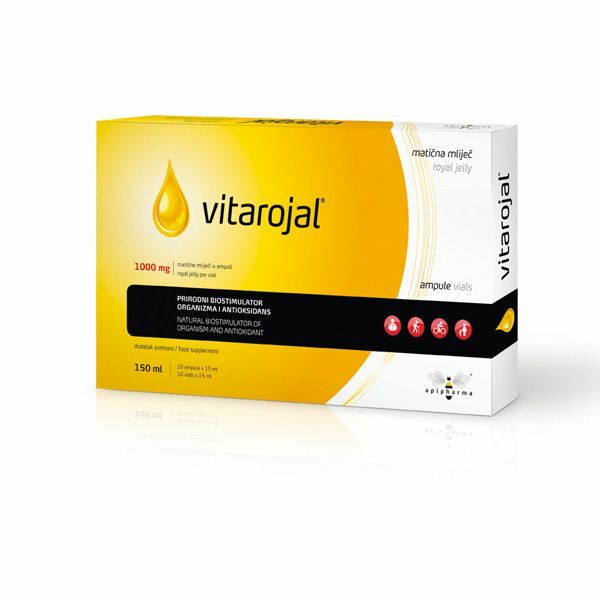 Vitarojal is recommended to elderly persons because of biostimulative activity of royal jelly which facilitates cell regeneration, improves physical mobility, intellectual forces and sexual drive. Regular application ensures vitality, healthy and calm old age. – elderly person to maintain vitality, mobility, intellectual quickness and sexual drive. Shake before use! Break the tip of the vial and pour into a glass. In order to avoid glass falling into the liquid, do not break the tip of the vial directly over the glass. Children over three years of age and adults should take 1 vial daily at breakfast time. It is recommended to dilute the contents in a glass of water or fruit juice. The product may be used several times a year, especially at the change of seasons. A sediment may form by standing, which disappears when vial is agitated.